The UK’s carbon dioxide emissions for 2018 were enough to melt an area of sea ice larger than the size of Cardiff, Edinburgh, Manchester and Birmingham combined. Research from the WWF found that at current levels, carbon dioxide emissions from the UK result in the loss of around 386 square miles (1,000 square km) of Arctic sea ice every September. Separate research published yesterday found the Alps could lose 90 per cent of their glacier ice by the end of the century. The Arctic is warming more than twice as fast as the global average with devastating consequences for wildlife like Pacific walrus – which has been highlighted in the new David Attenborough documentary Our Planet, the charity said. Rod Downie, Chief Polar Advisor at WWF said: ‘What is happening in the Arctic is nothing short of a crisis and the world needs to wake up and act. 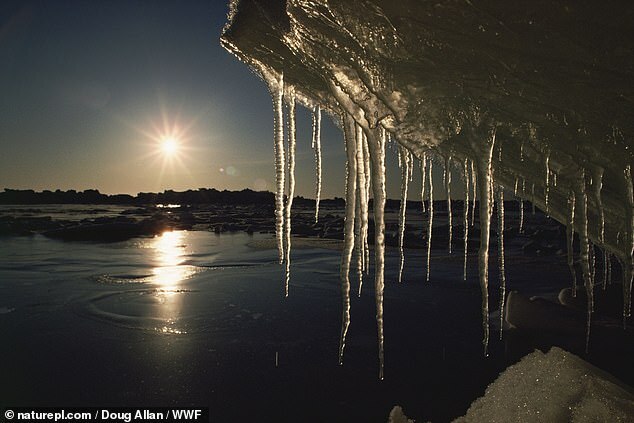 Sea ice decline is one of the most visible signs of climate change on our planet. ‘The bright surface of the ice reflects sunlight away from the planet and back into space, helping to keep our planet cool.